The notification has been released for recruitment of eligible male and female candidates in Police Department of Gujarat in 2016-2017. The candidates who wish to get a job in Police, must not miss this opportunity. 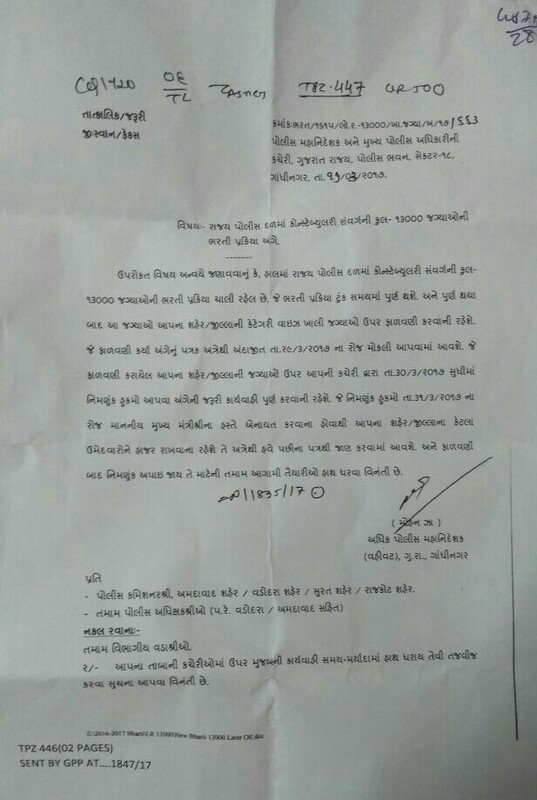 The Gujarat Lokrakshak Bharti Board is inviting Online Application from young and qualified candidates for filling up 17532 empty posts of Armed Constable Lokrakshak, Unarmed Constable Lokrakshak, SRP Constable and Jail Sipahi posts. The interested candidates can submit their Application via Online mode on official web portal at ojas.gujarat.gov.in. The Gujarat Lokrakshak Bharti Board is going to recruit 17532 various posts through Physical Tests (PST, PET), Written Test, Document Verification, Medical Exam and Final Selection. The candidates who will clear all stages will be selected as Constable Lokrakshak or SRP Constable or Jail Sipahi by Gujarat Police Recruitment Department (Lokrakshak Bharti Board). The candidates have to apply online for Gujarat Police Constable Lokrakshak Recruitment 2016 in between 7th July 2016 and 30th July 2016 on the official web at ojas.gujarat.gov.in. Any application registered or submitted after the given deadline will not be accepted in any circumstances. Thus the candidates are recommended to apply.